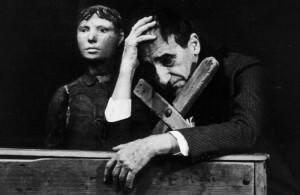 Tadeusz Kantor was a man of vivacious contradictions both politically and in his work, an artist who dramatized as well as provoked. His process-based methodology was comparable to a sponge that absorbs the various styles of art history and habitually condenses them. Societal repression, cultural waste, defencelessness and a variety of approaches to the ubiquity of death were recurring themes in Tadeusz Kantor’s practice. His work was shaped by both World Wars — the annihilation of the Jewish population in Krakow and later by the decline of public cultural life in the repressive society of communism during the Cold War. Today Kantor, who had early on proclaimed and lived a boundary-crossing concept of art, is among the best-known Polish artists of the 20th century. His later works of the 1980s were very personal reflections. As in Dead Class, he would sometimes represent himself on stage. In the 1990s, his works became well known in the United States due to presentations at Ellen Stewart’s La MaMa Experimental Theatre Club which inspired Lower East Side cultural leaders such as the Nuyorican poet Giannina Braschi. Throughout his life, Kantor had an interesting and unique relationship with Jewish culture, despite being a nominal Catholic Kantor incorporated many elements of what was known as “Jewish theatre” into his works. Kantor died in Kraków on December 8, 1990. 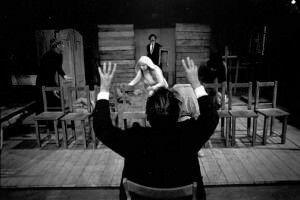 Throughout the world, Tadeusz Kantor is best known as an outstanding and highly original figure of 20th century theatre, as well as the creator of his own theatre group and of productions imbued with a poetry derived from the artist’s own complex private/public Galician origin. 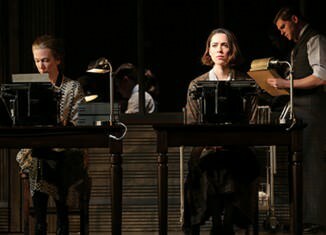 In Poland he played a number of roles, primarily within the Cracow artistic community with which Kantor was emotionally and artistically connected, if not fused. He was one of the most important figures on the Cracow art scene, acting as an integrator. Immediately after World War II, Kantor was amongst those who created the Young Visual Artists’ Group (1945); later, following the “thaw” of the mid-1950s, he once again demonstrated his penchant for organisation by helping to reactivate the pre-war Group (1957). He provided the impulse for the creation of the Krzysztofory Gallery, one of the first post-war galleries in Poland to exhibit contemporary art, and was involved in organising the 1st Modern Art Exhibition (Kraków, 1948). He played a dominating and commanding role in his community until he died, just before the premiere of his last theatrical production. It was titled, both ironically and symbolically, Dziś są moje urodziny / Today Is My Birthday. Kantor studied at the Academy of Fine Arts in Kraków from 1934 to 1939, his professors included painter and set designer Karol Frycz. Kantor himself would later return to teach from time to time at his alma mater (1948-49, 1967-69). Throughout his life he strove to combine a variety of activities: he was a lively animator of artistic life, an art theoretician and practitioner, a painter (and passionate promoter of Tashism) and one of the first artists in Poland to create happenings. But above all he was a man of the theatre, a playwright, director, set designer and actor. 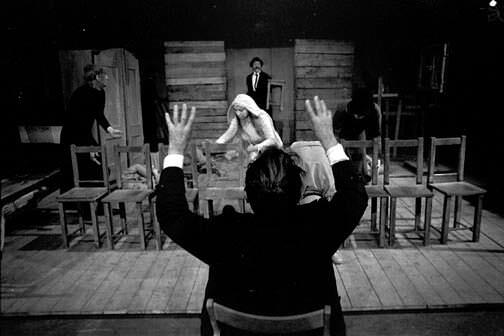 He is especially known as a pioneering reformer of the theater, whose purpose was to bridge the distance between the stage and “real life.” His touring company Cricot 2, which was founded in the ’50s with Maria Jarema and Kazimierz Mikulski, made Kantor world famous in the ’70s by and large for his “Theater of Death” cycle. His work, however, is also comprised of recently rediscovered Happenings, paintings, drawings, collages, sculptural props and costumes from his theater pieces, which he viewed as autonomous art objects. In addition he published a series of manifestos in which he explained the theoretical foundations of his approach to art. One of the most important influences and visual foundations for Tadeusz Kantor’s work after the Second World War was Art Informel. From this point on he used materials such as thick oil paint, old and used objects like rags, deteriorated books, trash and worm-eaten wood. All of the substances and objects utilized in his paintings and collages, as well as his stage sets and theater pieces, codify his definition of “matter,” which was shaped by Rosalind E. Krauss’ and Yve-Alain Bois’ concept of “formlessness.” The use of “formlessness” is a stylistic device that takes on the repression of the post-war period, in an effort to awaken emotions and to recognize a reality outside of restrictive norms. In his play The Dead Class (1975) Kantor attempted, through the wretchedness of objects and characters, to evoke “human arousal and […] human cries.” Kantor’s favored ephemeral materials act as recurring messengers of death, which often made appearances as people, mannequins, marionettes or symbolically as rattling wooden skeletons, as in Machine of Love and Death (1987). Although Kantor was known and recognized as a theater director during his lifetime, his extensive work has sparked tremendous interest posthumously especially among younger artists — and one can assume that art historical texts will be revised accordingly.